I used to read the ‘choose your own adventure’ books when I was a kid. 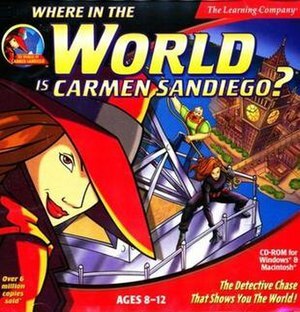 Things like “Where in the World is: Carmen Sandiego?” was one I really liked. They of course made a whole bunch of software games out of it, but the idea is still something I admire. Yet fail to replicate. I’m one of those writers where I have an outline, a plan, for both my storyline and characters before I even begin the first chapter. I may not have all of the details worked out or know what ‘quirks’ my heroine will possess, but I know all of the main scenes that build tension, conflict, and the climax, and I know how my story will end well before I start. Writing on the fly by the seat of my pants is never something I was able to do effectively. I’m not an impromptu person. Anyone who’s ever seen me give an impromptu speech completely understands it’s not my forte. Writing is the same way for me. I’ve tried it and end up going back and re-writing much of what I just wrote when I led myself into a dead-end or something extremely boring. I admire the writers who can, literally, sit down without a single thing planned in their head, and write a manuscript. And even more amazing, they write a story that’s intriguing, unique, and one I can’t put down. They don’t know what comes next, they let the characters decide the next scene. The next problem. Everything evolves in their mind as they write. My mind can’t ‘evolve’ like that. But even if I can’t get my mind to work like that in my writing career (can I call it a career even though I haven’t been published, yet? ), I love those kinds of stories. They give you a scenario and you have to choose a path: Option A- he travels to the crime scene, Option B- he calls the reporter with all the info, Option C- he fights the bartender for another drink, Option D- he kisses the girl senselessly and they drive off into the sunrise. All choices lead you in a different direction. And I wonder if the final outcome would be the same among all the various paths to choose? Now, with Carmen San Diego, they would lead you to dead ends and you’d have to back track to find the ‘right’ path (much like how my mind works when I write), but I still liked the option. What do you think? Do you like ‘choose your own adventure’ stories? For you writers, can you write on the fly or do you have to plan it out? For you readers, which do you think would be the most interesting to read? I used to love Carmen SanDeigo when I was a kid (they even made a television game show about it!). My style of writing is a mixture of both convention and unconventional style. I plan my story ahead of time, I don’t know specifics but I have a pretty comprehensive idea of what is going to happen to my characters throughout my novels. Having said that, I never write my stories from start to end in that order. I might wake up and decide to write the last scene. Then the next day I might write a scene from the middle and something from the beginning. In the end I have a bunch of puzzle pieces (scenes) in which I then start to assemble into order. Then I start the edit and meld them all together. I have been called crazy for this, but it is the way I love to write and it hasn’t let me down yet. Thanks for sharing and the walk down memory lane!